The ability of your heavy equipment operators will have a direct impact on the success of your construction projects. Skilled operators know how to maximize the performance of a machine and — even more importantly — use it safely. Effective construction operator training is essential for ensuring the members of your team know how to handle and maneuver equipment in a safe and productive manner. 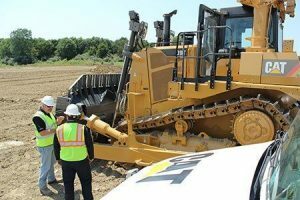 As an authorized Cat® equipment dealer, Gregory Poole can provide comprehensive construction operator training for our eastern North Carolina client base. Training sessions are conducted by experienced Certified Dealer Instructors who have a sound understanding of the skills required to operate Cat construction machines productively and safely. Your team will also learn to apply valuable techniques for running machines to increase fuel efficiency and minimize wear and tear. Level 3 – Evaluation of operator knowledge and skills against defined competency standards. Certification, not training. Are you planning to purchase a brand-new Cat construction machine? Gregory Poole offers new Cat machine instruction so your operators become familiar with the latest Cat equipment features and technological innovations. Training sessions are conducted in person at your facility or jobsite. A Certified Dealer Instructor will come out to your jobsite and spend time with the operator going over machine features and operation at no cost to the customer. A revisit to the unit will be done 4 – 6 months from date of delivery to follow up with customer on any questions — no cost to the customer.